Hyundai Motor and Kia Motors, South Korea’s two leading automotive firms, are expected to record a drop in second-quarter earnings this year due to slowing demand in China and the US on top of uncertainties surrounding a global trade war, industry data showed Tuesday. According to data compiled by market researcher FN Guide, Hyundai Motor’s operating profit for the second quarter is projected to slide 22.3 percent on-year to 1.04 trillion won ($928 million), while its earnings will drop 0.6 percent to 24.1 trillion won. Hyundai’s sister firm Kia Motors will also see its second quarter-operating profit and earnings shrink by 1.6 percent and 0.3 percent on-year respectively, data showed. To bolster demand in the second half of the year, Hyundai and Kia will release over 10 new models here and in their two biggest markets, the US and China. 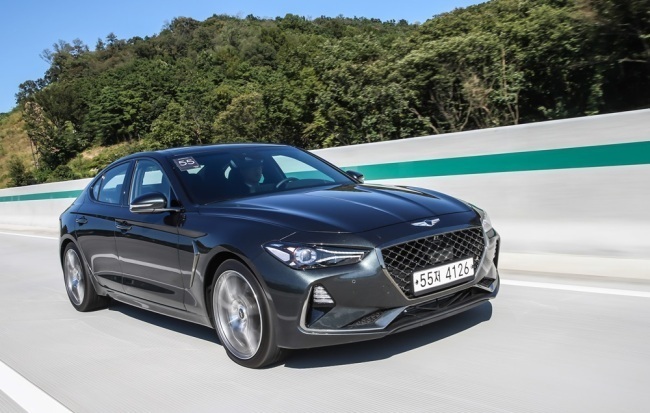 In the US, the G70 sedan made by Hyundai’s high-end brand Genesis is slated for launch this summer, completing the brand’s sedan lineup, which also consists of the G90 large sedan and G80 midsize sedan, the company said. Some 10,000 units of Genesis sedans were sold in May, 39.2 percent less than in May 2017. Hyundai’s new SantaFe popular midsize sport utility vehicle, the electric version of the Kona compact SUV and the Nexo fuel cell EV with a driving range of 608 kilometers are also to hit showrooms within the year. “Hyundai and Kia are doing quite well at home and in Europe, but they are still struggling in the US and China. New models, downsized inventories and less incentives will turn around the automakers’ performance in the third quarter,” Koh Tae-bong, a senior analyst at Hi Investment & Securities, told The Korea Herald. In China, where the two carmakers are struggling to restore sales to levels before a spat over the deployment of an anti-missile system, Hyundai is preparing to introduce the Lafesta sports sedan designed for the Chinese market, the China-exclusive Celesta five-door sedan and the Sonata plug-in hybrid, while Kia will release three new models including the new Yi Pao urban SUV. Hyundai saw its sales in China drop 17 percent on-year in the first quarter of this year, and sold about 54,000 units per month on average, the company said. Implementing a flexible management system, Hyundai Motor established regional headquarters in North America, Europe and India last month, and Kia Motors’ in North America and Europe, the company said. This is part of the group’s strategic move to break away from the conventional top-down structure, allowing each regional headquarters to practice the most suitable sales and management.